Each of our treatments have diferent essential holistic healing element. All of our treatments are designed based on understanding and knowing the human anatomy, physiology. Our Organic hanging herbs garden at Citrus Health Spa allows us to produce herbs for our treatment . We Are Using 100% Of Nature Products. Special massage techniques and warm therapeutic oil/fresh coconut milk or warm herbs to balance body and mind for Dosha: Vata, Pitta or Kapha. Cool white marble stones from Marble Mountain 'five elements' to work on the five elements of the body. Using organic essential oils. Warm bamboo stick rolling over your body muscles to create a feeling of wellbeing and relaxation. Traditional techniques of cupping combined with aromatherapy oil and acupressure, stimulates, drainage of the lymphatic system and balancing the body. Warm stones are placed on Chakras and then massaged over the body promoting a deep state of re-laxation, dissolving muscular tension and soothing away stress. Organic oil of geranium and lavender are used over Marma points to balance and give harmony to mother and baby. Opening the flow of energy in the head and neck areas with acupressure technique. Using pomelo essential oil leaves the hair with a nourished and healthy look. The traditional Japanese Acupressure Therapy applied to your scalp, face, back, arms and feet.The ideal treatment if you prefer strong pressure. Style-pyjamas are provided for this non-oil massage. Traditional massage delivered using palm, elbow and thumbs technique for muscle pain relieve, improving blood circulation and releasing tension, clear energy blockages, harmonizing the body with Aroma Therapy Oil. Pressure point and stretching natural health therapy and opening the flow of energy from head to toes. Style-pymamas are provided for this non-oil massage. To stimulate nerve function, increase energy boosts circulation, eliminate toxins and induce a deep state of relaxation. Dry skin-aging/ normal-dry skin / sensitive skin / oily skin / acne skin. We only use organic facial treatment products. Paraffin treatment soothes chronic joint pain and improves blood flow. Including cuticle, nail cutting and applying color. Organic products to scrub, remove callus, mask and moisturizing, including a mini massage and color. We ofer complete waxing service using natural products from Australia. Very convenient and last longer. Detoxifying treatment designed to refine the texture of the skin, ideal for cellulite and stress. The Himalayan salt is a blend of ingredients that will stimulate blood and the lymph system, and improve skin tone. The treatment is followed by a shower and a mini massage with organic body moisturizer. 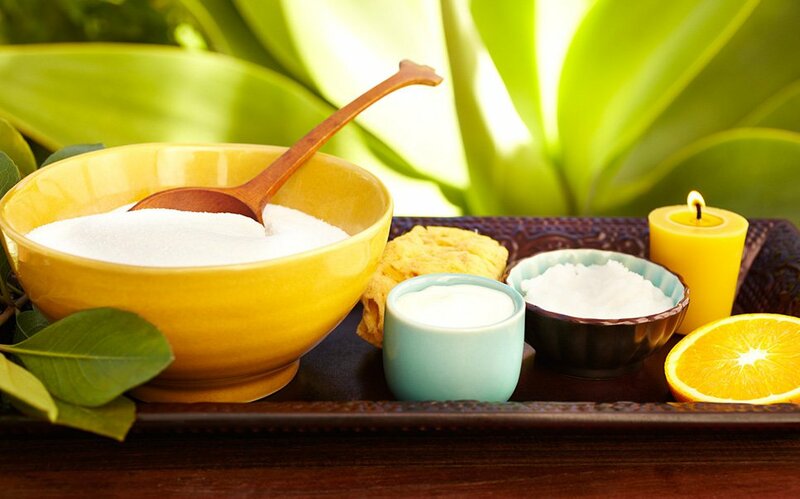 Using Aloe Vera, with its high antioxidant and amino acid content, this treatment rejuvenates tired or dull skin. It has long been used as a remedy to sooth sunburnt skin. To cleanse, remove dead skin, hydrate and improve skin tone. Choose one of the following: organic lotus flower powder; lotus seed; coffee; sesame; frangipani flower; jasmine flower; fresh rose flower; brown rice; fresh orange; or coconut rice. Choose from: pumpkin, honey & fresh milk: carrot, yogurt & honey; numeric & honey; oatmeal & honey; rice bran & fresh coconut milk; red bean & fresh milk.